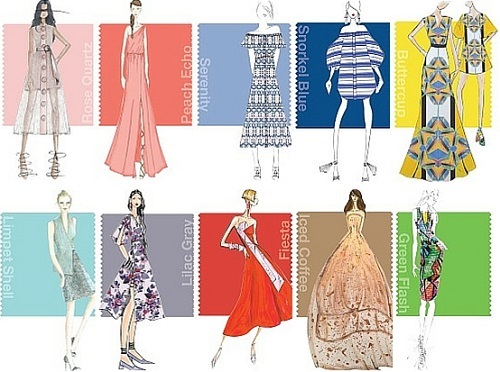 I find it fascinating that this year many of the official fashion trend reporters (Vogue, Elle, In Style) are reporting that the spring summer collections are designed to express your personality. I think this is another way of saying the continuing trend is for a vast range of fashion choices. If you want to show your bohemian, creative spirit the clothes are available to let you do so. If you want to express yourself as a capable modern professional there are elegant modern classic clothes available. If your personal preference is for soft, floaty, feminine looks the clothing choices are available to create that look as well. 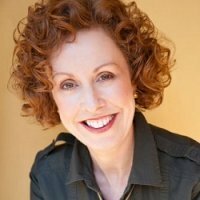 The key, of course, is to understand who you are and how you want to be seen. Not who you were last year or last decade, but who you are now! If you'd like help I'm here to help. Overall the runway trend towards more relaxed silhouettes and more volume continues. 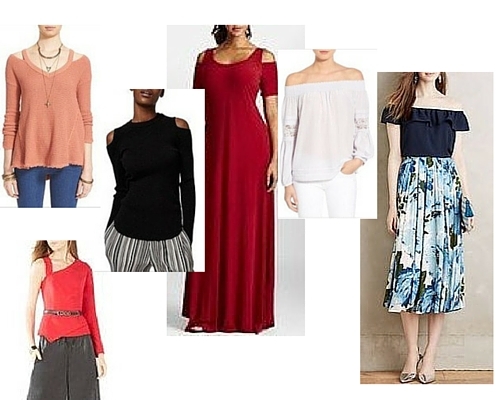 This is reflected in wider leg pants (including wide leg cropped pants), midi lengths in skirts and dresses, A-line skirts and large, floaty tops. And now even sleeves are getting fuller and wider! 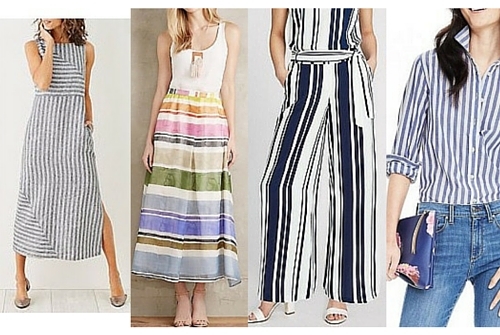 My favorite round up of the best spring summer fashion trends this year comes from PopSugar. You can see it here. Below I've listed some of the trends showing examples of styles already available in the stores. To update your spring and summer wardrobe use the trends to first go shopping in your own wardrobe. Do you already own one or more of these styles? Can you create new outfit combinations that feel contemporary? For example, try layering a tee-shirt under a dress; or a new combination of top, bottom, shoes and jewellery. If you review your wardrobe regularly you'll likely only need to shop for a few items. 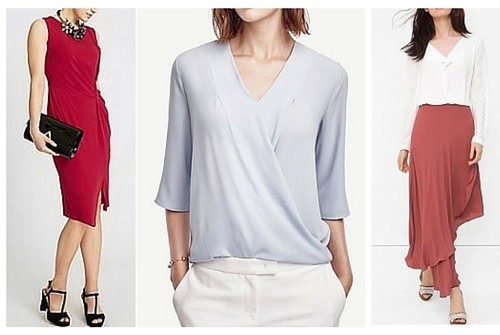 Choose 1 or 2 of the new trends that appeal to you and work them back into your wardrobe. Remember to create whole outfits now, so you have everything you need to use each item of clothing, pair of shoes and jewellery in at least 1 or 2 outfits. And do think about possible outfits for events and activities for the coming 3-6 months. Off the shoulder tops and dresses are a strong trend this spring and summer. This style adds to the shoulder cut-out style (being called 'cold shoulder' introduced in recent seasons and still available). 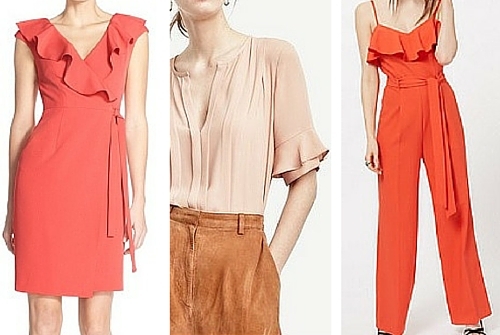 One shoulder and asymmetric shoulder styles are also available. The Anthrologie outfit on the far right an example of how to style an off-the-shoulder top with this season's fuller, midi skirt and shiny silver shoes. 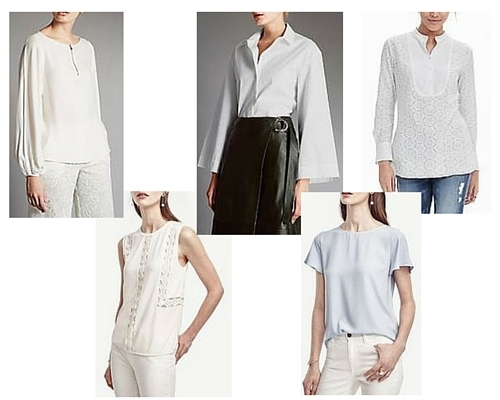 There's a wide variety of white shirts, blouses and tops this season. Look for interesting textures such as laser-cut embroidery. You may be tempted to immediately discount this trend! However, patterned PJ-style pants have been around for a while and are both comfortable and easy to dress up or down. Although wearing a matching PJ-set will be a step too far for many! I've been wearing slip-style dresses as a skirt or under a too-short dress for a few seasons. The latest trend is the return of the satin or silky slip dress. However, a new twist, that perhaps makes it slightly more wearable, is layering a tee-shirt or blouse underneath. Or wearing a duster-style cardigan/coat over the top, or a heavier weight long-line cardigan. Combining unexpected fabric, color, pattern and/or texture combinations (leather and lace, sheer and sleek) either within one garment (by the maker), or in creating an outfit. If you have a creative style personality you'll be doing this anyway. 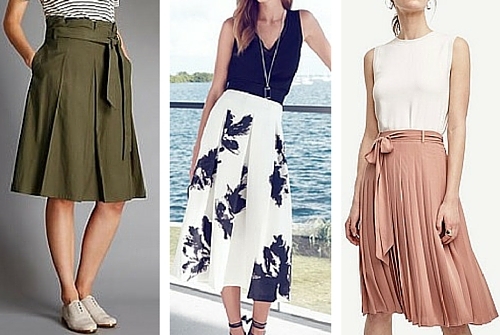 There are a variety of pleats styles (such as: fine, wide, soft, stiff) mainly in skirts. However you'll find them in dresses and blouses as well. 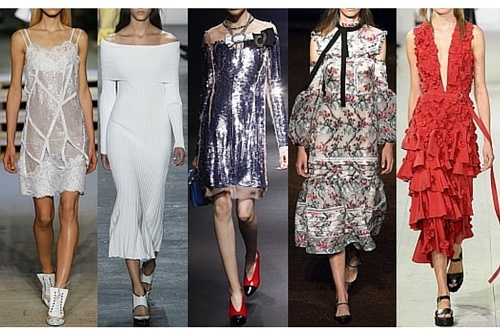 Statement ruffles are back, conjuring up Spanish Flamenco-style dresses, or peasant styles. However, they're not just on dresses. You'll also find them on tops, skirt and jumpsuits (yes, jumpsuits are still around!). Especially sequins and shiny silver. Try silver sneakers or sandals with white pants for a stylish casual look that adds just a touch of shine. Florals are also a strong pattern trend. Especially botanical-look prints. This style, that suits so many women, is now more widely available. Look for wrap dresses, tops and also the return of wrapped skirts. You'll notice quite a few of them in use in the trend images above.